I know that the inking on the Frostwings was changed from the TSR to the current SFR dice runs. I was curiously wondering a few things. - What other dice have used different inking over any set releases? - What about the promos. - Some of the initial 4 races had slightly different shades. Do people care for those? - Is there any real demand or value which is skewed because of these? Would you value or prefer one over the other? - for anyone who answers, do you have a preference of ink? Would you care not to mix them? I just received a bunch of dice from a trade online, and i didnt even think to realize that the Frostwings in the lot might be the TSR ones. Now i wonder if i should take my 8-4-2-1 race spilt, and either try to complete it in TSR, SFR, or perhaps try to split it down the middle for both. Though the monsters would be a mix of that. Would anyone even care to swap one over for the other? Sorry for all the questions. Just wanted to know peoples opinions on the whole thing. Officially, Frostwings were made in 3 colors: Light Blue (TSR), White (SFR), and Black (SFR-promo, rares and monsters only). Scalders were also made in 3 colors: Cream (TSR), White (SFR), and Black (SFR-promo, rares and monsters only). Most of the Eldarim Champions were made in at least 2 colors of ink, a few in three. 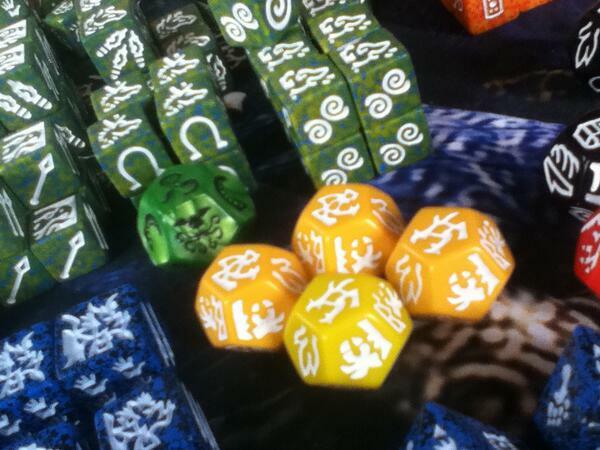 Otherwise, except for some prototype dice, those are the only color variations of ink. See my website for more information about the variations of various dice. Frostwings promos are yellow- inked, not black. Oops, mixed up the Frostwing prototypes with the promos. Most of my dice are from the original TSR starter sets, plus some of the latest SFR kickers for the original races, and some new run terrains as well. I greatly prefer the new dice. You can tell what the colours actually are, they're not muddied together! The improvement is most notable for the Goblins and all 4 Terrain dice, but all of them are better now. Another odd question too. I know some of the earlier Dwarves and Goblins are sometimes off in color, based on the plastic used. Though, i was sorting through some dice again, and while going through the dragon extras, i noticed that i have a Gold Drake which the plastic is noticeably yellow, and not the usual mustard gold color. It actually looks like a larger contrast than the lighting on the picture shows. Edit: tags dont quite seem to work for some reason. havnt disabled html either. Just copy and paste you your browser if you're curious for now, i guess. Yes, I have Gold and Green Dragons in very different hues. Edited the post several times, and had it there too. Still didn't work. No worries. The 'gold' turned 'yellow' a few years ago. The 'story' we were told is that they don't 'make' that color of plastic anymore. I won't comment on what that smells like, but we had to pay extra just to get the yellow because it wasn't 'standard'. So while this isn't optimal, it was better than having NO 'gold' dragon at all. The Green Dragons are looking kind of pale too nowadays.